The conditioning of flowers depends upon the type of foliage and particularly the stems of the flowers being conditioned. The main stem types include hard, soft, woody and hollow. The likes of Irises and tulips and other bulb plants have tender fleshy stems. 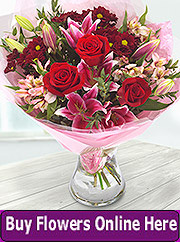 Roses and carnations have harder stems, and protea and lilac have large and woody stems and branches. Delphiniums and lupins have thick hollow stems. Finally there are the bleeding stems of flowers such as daffodils, euphorbia and poppies, that produce large amounts of sap. 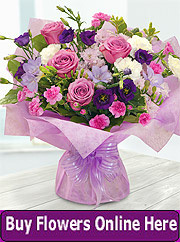 Woody stemmed flowers and floristry material such as viburnum, prunus, and forsythia are now generally available to florists. Such sources of woody material is particularly useful for more substantial displays or as an unusual inclusion in more regular florists' arrangements. Woody stems usually have problems absorbing water and in the past it was recommended that the cut stems should be crushed with a hammer or some such implement. More recent thought on the issue agree that splitting the stem is the correct approach but the crushing can actually be harmful. Crushed stems do not absorb water easily and begin to rapidly decompose. Current best advice is to cross-cut the stem base to a depth of 3 to 4cm. Another difficulty with woody stems and other shrubbery flowers is that the foliage is prone to wilting. Even in ideal conditions the leaves can wilt while the blooms remain robust. It is possible that the demand of the leaves and flowers are too much and since the flowers are the reproductive element of the plant they receive priority ahead of the leaves. This is a notable feature with lilac and prunus. 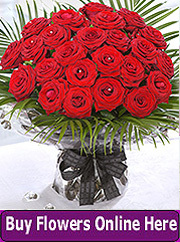 It is best to remove excess leaves or for optimum flower life some florist remove all foliage from woody stems. Not only does this remove competition for water by the leaves it also allows the flowers to be viewed without any obstruction. Old fashioned or typical garden blossoms such as lupins and delphiniums have hollow stems and their tall spires add height to florists' designs. When a flower stem is cut air is trapped inside of the cut stem when placed in water. As the stem tries to absorb the water it draws the air up the stem until it reaches the neck of the flower. At this point the air has nowhere to go and acts as a block to any further absorption of water by the bloom. To avoid this carefully turn the flower upside-down and slowly fill the hollow stem with water which will expel the air from the stem. 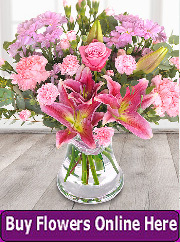 Place your thumb over the cut end of the hollow stem and turn the flower to an upright position in a container of water to absorb water in the normal manner. When using such stems in a flower arrangement some florist use s plug of tissue in order to prevent air re-entering the stem. Some florists advocate puncturing the flower stem at the neck of the flower with a clean fine needle which permits any air to escape. Some blooms and foliage lose significant moisture when they are cut from the parent plant. These are called bleeding stems. In some cases the plant sap actually oozes from the cut from the moment of the cut. This ooze continues until the plant forms a 'scab' or callus over the cut area. In the time that it takes the callus to form the stem may have lost substantial important moisture. Aside from being a possible irritant to the skin of the florist this sap may also be toxic for other flowers that share the same water. In a somewhat dramatic form of flower conditioning the cut is exposed to the flame of a candle or match for a couple of seconds which cauterises the cut. This prevents the flow of plant sap but does not prevent the stem from drinking water. 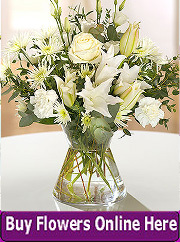 Stems that have been properly cauterised can safely share the same water as other flowers however if the stems are cut again prior to arranging them they must be cauterised again. An alternative to flame is to dip the cut area in boiling water but take care to protect the foliage and flower heads from any steam damage. Experienced florists take the precaution of wearing protective gloves when handling bleeding stem-types. Some even wear protective goggles to prevent any irritation of the eyes. The sap of many plants can cause irritation to humans but particular care should be taken when dealing with any plants that leak any milk white latex sap such as that found in euphorbia. Hellebores also produce an intensely irritating or burning sensation on the skin. Although they are in the hollow stem group narcissi and daffodils produce sap that can be toxic to other flowers if they share the same water. They cannot be cauterised so the best way to deal with them is to stand them in water by themselves immediately after cutting. Change the water after one hour and leave them to stand for at least another hour. Following this they can be mixed with other flowers. Bleeding stemmed flowers include poppies, all types of ficus, and most types of euphorbia.